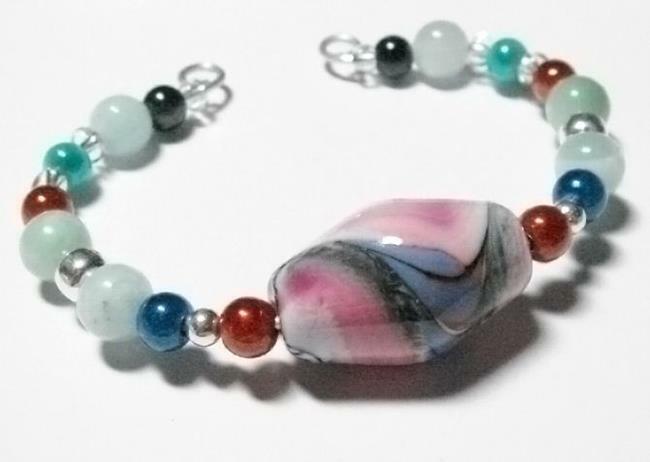 I call this bracelet "Destin Twist" because the focal bead reminds me of a long ago vacation to the Sandestin Beach Resort in Destin, FL. The whole trip was just really amazing and serene and the dawn and dusk skies blazed with reds, coppers and pinks against a brilliant aquamarine blue Gulf of Mexico. A real mental vacation! This bangle features a focal bead by 3 Muses Glass as well as 8mm Amazonite beads, 4mm glass spacer beads, 4 and 6mm round sterling silver beads and top quality Miracle Beads which have the most fun, funky reflective effect - stay safe when you're out, these beads will catch light the same way road signs do!The bangle is sized for an average wrist but can be tightened or loosened as necessary with firm pressure to the actual shape of the bracelet.